The CDC (Center for Disease Control) reports that in the 2013 flu season, illness is way up in every state and in many areas, the rate is ten times that of 2012. These statistics suggest a flu pandemic for the 2013 flu season. The CDC has a comprehensive health website with everything you need to know about preventing and treating seasonal influenza (www.cdc.gov/flu/index/htm). They stress the importance of hydration during illness and recovery and they urge people to drink "plenty of water" (or "clear liquids") and to avoid dehydration, "which can be very serious." In keeping with the philosophy that proactive health education is essential for survival in our rapidly changing world, Bio-Logic Aqua Research founder Sharon Kleyne has researched the dehydration, flu prevention and flu treatment. Here is a recap of the CDC's excellent advice, with additional information based on Bio-Logic Aqua Research's extensive dehydration research. "Flu" is short for "influenza," the beginning of an Italian phrase meaning "influence of the stars." The Italians originally attributed the disease to astrological alignment of the stars. In fact, flu is a virus that can be spread by sneezing, touching contaminated surfaces and eating contaminated foods. Because the influenza virus constantly mutates, immunizing flu shots must be changed every year and cannot cover every possible flu strain. Also, flu strains in animals that had been harmless to humans can mutate and suddenly start making us sick, as in swine flu and bird flu. The 2013 flu shot immunizes against: Influenza A (H1N1), influenza A (H3N2) and influenza B. Flu can be mild to severe and could cause death if a mutant strain is virulent enough (as in the 1918 flu pandemic, believed to have killed 100 million people worldwide) or for those who fall into a high risk category such as children, people with lung (COPD or asthma) or heart problems or the elderly. Flu can lead to secondary infections such as pneumonia and sinus or ear infections. DRINK PLENTY OF WATER OR "CLEAR LIQUIDS" to prevent dehydration (See "regarding water," below).. Treat fever, cough or nausea with over-the-counter medications. See a doctor if you are in a high risk category or your symptoms become worrisome. The CDC cautions that "dehydration is very serious" and can cause death. They offer the following suggestions to prevent or reverse fluid loss. Drink plenty of water or "clear liquids." Older adults or people with kidney problems should check with their doctor about how much water to drink. It is OK to breast fed if you are dehydrated or ill. It will not affect your baby. Treating a fever can also help treat dehydration. Again, drink plenty of water or "clear liquids." 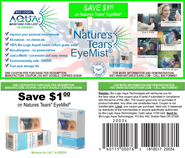 Bio-Logic Aqua Research recommends at least eight glasses (eight ounces per glass) of pure fresh water per day. Drink ten glasses if you are ill, have dehydration symptoms, following heavy exercise or if it's very hot out. AT LEAST 75% OF THIS SHOULD BE PURE FRESH WATER. The other 25% may be clear liquids such as apple juice, Seven-up, vitamin water or caffeine-free tea. Drink at least four glasses of water all at once rather than sipping them. If you have difficulty keeping fluids down, a hydrating sports drink containing water, sugar, sodium and potassium can be helpful as long as they contain no caffeine or other energy boosters. © 2013 Bio-Logic Aqua Research (176). Sponsored by Nature's Tears® EyeMist® for dry eye.